Halloumi brand cheese is a type of Greek grilling cheese. It is unique, because it maintains is shape during the grilling process and is warm and somewhat gooey on the inside. There are many varieties of Greek grilling cheeses to choose from, so if you can’t find this type, select another type, such as, kasseri. In this recipe, I have skewered the cheese, but it can also be sliced in larger pieces and placed directly on the grill. A large grilling basket will be needed for the skewers, or if you are not in the mood for grilling, they can be baked on a baking sheet in the oven. If you are making the Baked Pita Chips, please make sure you have the ingredients it calls for. The reason for using Spicewood Balsamic Vinegar Aged 18 Years is that it is like a balsamic reduction which is sweet and smooth and can be purchased on-line at Spicewood Food Company Balsamic Vinegar Aged 18 Years . Ingredient amounts will make 4 skewers as shown. If you like this recipe, try my other recipes using Greek grilling cheeses Halloumi Cheese Appetizer or Brushetta with Kasseri Cheese. If you are making the Baked Pita Chips, make them and set aside. Cut the cheese into chunks, about 1 ½ inch cubes. 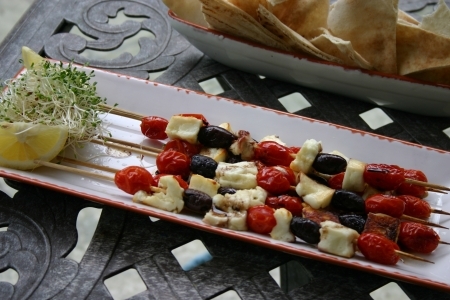 Skewer by alternating the cheese, grape tomatoes and kalamata olives. Once skewered place them onto a preheated grill on medium in a grill basket and grill for about 3 -5 minutes, turning once until cheese is starting to melt. Alternatively, place on a baking sheet sprayed with non-stick cooking spray. Spray each skewer with non-stick cooking spray. Bake in preheated oven at 375 for about 15 minutes or until cheese starts to melt. Remove from grill or oven and place on a serving dish and drizzle with balsamic vinegar and squeeze a wedge of lemon over the skewers. Serve with alfalfa sprouts if using and Baked Pita Chips. Garnish with additional lemon wedges. Try Shades of Africa Sauvignon Blanc (Africa), Chateau St. Michelle Sauvignon Blanc (Columbia Valley), Saint Arnold’s Lawn Mower (Texas), any of your favorite summer beer by Sam Adams or an ice cold long neck Bud or Bud Light.